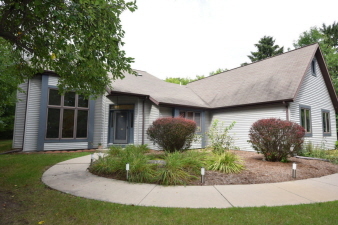 Mequon Contemporary on private acre with coveted large master bedroom suite that boasts walk-in closet and generous private bath. Living room with soaring ceiling, balcony loft and den, and the family room all feature skylights. The kitchen is open to family and dining rooms. Convenient main floor laundry room. Large garage provides lots of extra storage space. Poured basement is plumbed for additional bathroom.